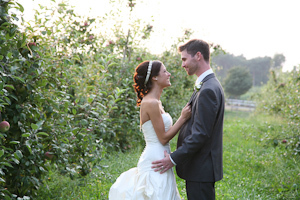 A golden field, an apple orchard, a red barn... Who doesn't love a wedding with some rustic elegance? Or maybe just plain rustic? Well, I sure do, and I wanted to put together a few of my favorites here on the blog. If Pinterest is any indication, I don't think the farm/barn wedding trend is going away anytime soon! 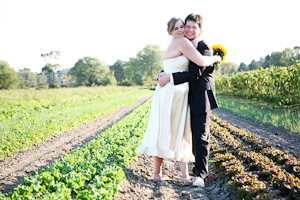 I'm happy for that - I love tromping through fields, doing outdoor ceremonies, and getting some fun wedding party photos in front of that barn door or in a row of vegetables (if they let us, of course!). Some couples like to bring their cowboy boots too for a little more authentic farm flair. Or, if you're lucky enough to have your own pony or goat (just click on the last wedding link here), they just might steal the show! 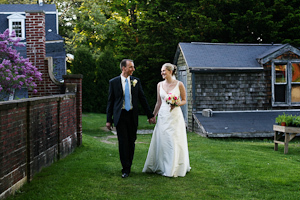 Not all farm and barn wedding venues are the same, of course. Some do many events and weddings throughout the year, others open only occasionally to a lucky few. Some have all the amenities included, others you might really be roughing it. Either way, if you are looking for a rustic farm wedding in the Massachusetts area, I think you have a lot of places to choose from. 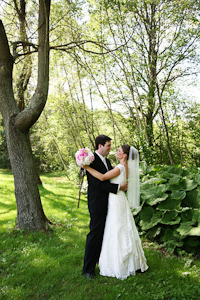 I've been to Brooksby Farms multiple times for weddings, and it's always a perfect setting... The red barn has a huge central dance floor in front of the big barn doors, and everyone can come and go outside as they please, to enjoy the surrounding fields. You can also have the ceremony across the street behind the historic Nathaniel Felton Junior House in the Peabody Historical Society's Woodland Gardens. If you'd like to be in the middle of a real working farm, Verrill Farm would be the place for you. Not a lot of frills, but it was the perfect place to be on this sunny September day for Susan & Nate's wedding. I'm absolutely in love with all the sunflower details and yellow accents! A more upscale choice, with gorgeous manicured gardens and fountains, Moraine Farm is right on Wenham Lake in Beverly, Massachusetts. The actual wedding location is at the Estate at Moraine Farm, so you will probably only see farmlands while driving around the grounds. They set up an amazing tent right outside the estate house, and you'd have a gorgeous room to get ready in at the estate. Glen Magna has to be one of the best places for a wedding photographer! SO many photo locations to choose from, it makes it a bit tough to narrow down, but somehow, we manage. :) I can't say enough good things about Glen Magna Farms - the wisteria on the wedding arbor, the grand house (where you can get ready, and if you'd like, have your reception inside as well), the tree-lined pathways, the little out-buildings and secret gardens all around... Sigh. Okay, just go see more of it, I promise, you'll love it. Aaaand... Okay, this isn't a wedding, but you can always break out your rustic side by doing a farm engagement session. This one was at Russell Orchards and Appleton Farms, both in Ipswich, Massachusetts.